The latest version of Infuse for iPhone, iPad, and Apple TV is here and contains a number of things that we think you're really going to enjoy! We've added a slick new list view option that provides quick access to video artwork and details. It has all the same great details as the standard poster view, and should allow you to feel right at home when you start using it. List View can be enabled in Infuse > Settings. We've had our nose to the grindstone over the past few weeks, and today we're pleased to finally share the fruits of our labor with you. Infuse 4.2 is a major update, and introduces a bunch of great features we know you're going to love! Read on for full details on what's new. Introducing our brand spankin’ new Library View which makes finding videos to watch quick and easy. Infuse will search deep within your folders to catalog every movie, TV show, and cat video it can find and group them all together in a slick new menu. Plus, with a set of all-new Smart Filters, you can browse by genre, rating, release date, age rating, and even get an overview of all unwatched or recently added items with just a few taps. The first major update for Infuse 4 has arrived! We didn't cut any corners here, and worked hard to add ton of great new things that we think you are going to love, including watched icons, dark mode, HD audio, background fetching, and much, much more. Read on for full details on what's new. With our all-new watched indicators finding something new to watch has never been easier. Both new and in-progress videos will have a colorful orange banner overlayed on top of the poster, with a small icon to indicate the status. Watched status icons are also visible on the video details page. Infuse 4 for iOS has arrived! At first glance, Infuse 4 may look like something you've seen before, but that is where the similarities end. We've gone deep under the hood to make significant changes in just about every area. The end result is an all-new playback core, built on modern frameworks, that take full advantage of Apple's latest hardware. Naturally, we've also added a few other goodies as well...read on for more details. Our new high-performance playback core has been optimized to work great with newer devices, including the iPad Pro. We've also fine-tuned things for speedy browsing, great battery life, and silky-smooth playback of videos with resolutions up to 4K. When Apple first announced the new Apple TV in September we couldn't help but do a little happy dance. A powerful new device with an official App Store - what more could we ask for? There was just one thing missing - a great way to enjoy videos without having to jump through any silly hoops like converting or transcoding. 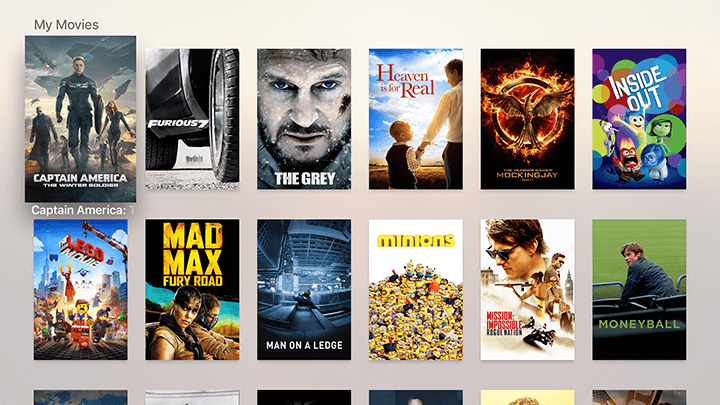 Well, the wait is over, and the all-new version of Infuse for the new Apple TV has arrived. We've taken many of the same great features we perfected in Infuse for iOS and reimagined them for the big screen. The end result is a beautiful, powerful, and simple way to enjoy a wide array of videos on the Apple TV. And now, without further ado, we give you Infuse 4 for Apple TV. Infuse supports a massive array of video types, and is the only player on Apple TV that allows movies to be heard the way they were meant to be, with full support for Dolby (AC3) and DTS audio...with surround sound passthrough of course. As you can imagine, it's been a very busy fall here, to say the least. However, we're now (finally!) starting to see a beautiful bright light at the end of the tunnel, and that light is coming into form as Infuse 4 for Apple TV. We think what we've made is really great and we can't wait to share it with you very soon. We're also happy to announce that Infuse 4 for Apple TV will be a free update for all current (v3) Infuse Pro users.